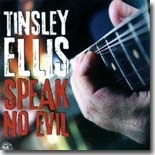 Speak No Evil is definitely one of Tinsley Ellis� finest recordings for Alligator Records and the good folks at the Blues Foundation who handle the Blues Music Awards nominations evidently think so too --- Speak No Evil has been nominated for Rock/Blues Album of the Year. Sounds like a pretty good recommendation to me, so let�s give it a listen. �Speak No Evil� finds Tinsley admonishing someone to think twice before speaking their mind. �No matter where I go�no matter what I do or say�somebody rather tell on me�when they ought to back away!� And Tinsley�s right, �words thrown out in anger�always come back to haunt you!� It�s better to think twice before speaking evil of someone. �It Take What It Takes� finds Tinsley reminiscing about a relationship gone bad. �Takes what it takes�to be alone at night�takes what it takes�to make me feel all right�takes what it takes�to get over you�oh, baby�takes what it takes.� Tinsley admits to treating her badly, she really didn�t have an option to stay. Takes what it takes. This theme continues in �The Other Side,� a tune about another relationship about to come to an end. �Since you won�t be around much longer�let�s just plan to meet up�on the other side!� At least Tinsley appears to be facing the end with a clear mind. �Cold Love, Hot Night� finds Tinsley at odds with a woman he loves. She�s a cold woman and he�s very hard to please, somehow he�s trying to meet her in the middle and make it work. �The hardest part of forgiveness�is probably just pinning you down�so hard to say we�re sorry�dogging each other round town�our love has got a sickness�and the reason�s plain to see�cold love�hot night�I can�t sleep�with this burning inside�cold love�hot night�.again.� Communication is the key and it�s just not happening here. �I�ll be damned to watch you drive away�into this hot, Georgia night.� As much as Tinsley wants to work it out, she�s just not helping him do it. Speak No Evil closes with the rocking �Grow a Pair� and the instrumental �Rockslide.� �Too many days�and so many nights�now I need you by my side�you like water to a driving man�need a lot of courage�to take a chance�ain�t no use in just standing there�I won�t get what I want�till I grow a pair!� That�s life; you ain�t going to get what you want if you don�t grow a pair. I go could on for paragraphs about the musicality of this disc by Tinsley. It features rocking guitar from beginning to end and is a dish best served loud. Tinsley�s at the top of his game and his supporting cast is up to the task. Speak No Evil is a great disc and one you can pick up from Tinsley at www.tinsleyellis.com or the Alligator records site as well. All I can tell you is to enjoy it, I definitely did!